Each day you are confronted by advertising, multinationals trying to influence you. What tricks do they use? And what can we learn from them? 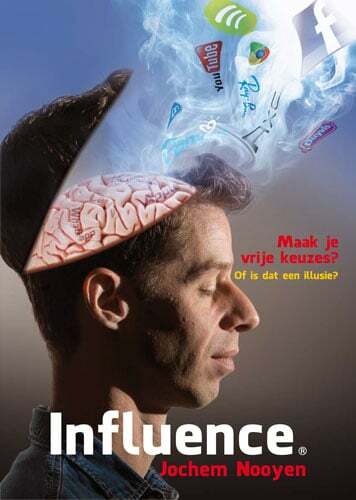 Illusionist Jochem Nooyen answers all these questions in his show ‘Influence’. It is a magical show full of illusions and special acts. It is an interactive show that makes you wonder why you know the slogan ‘ Once you pop you can’t stop’, but didn’t know why you really can’t stop eating the crisps. Influence is a magic keynote show for meetings and seminars. It is an energetic mind-illusionshow on influence techniques and marketing. Jochem tells stories on how he himself got influenced to buy stuff he never wanted to buy. In a theatrical and fun way Jochem teaches how to influence others, and with live audience experiments he displays how easy it is to influence the audience members. It’s a 45 minute interactive and energetic show. Informative and entertaining. Everybody will be talking about this after wards and will take the experience with them. It needs a theatre setting where the audience is situated in front of the stage. get more info by using the form below. Time: 8:30pm. Admission: 15. Age restrictions: All Ages. Box office: 0183 – 69 00 22. Address: BOERENSTRAAT 11 B 4201 GA. Venue phone: 0183 – 69 00 22. Time: 8:15pm. Admission: nnb. Age restrictions: All Ages. Time: 8:15pm. Admission: € 16,-. Age restrictions: All Ages. Time: 8:15pm. Admission: € 17,50. Age restrictions: All Ages. Time: 8:00pm. Admission: 17,50. Age restrictions: All Ages. Time: 8:30pm. Admission: € 10,-. Age restrictions: All Ages. Time: 8:30pm. Admission: € 16,-. Age restrictions: All Ages. Time: 8:15pm. Admission: € 15,-. Age restrictions: All Ages. Time: 8:15pm. Admission: € 19,-. Age restrictions: All Ages. Time: 8:30pm. Admission: € 16,50. Age restrictions: All Ages. Box office: 0497 57 13 18. Time: 8:30pm. Admission: € 10,- / €12,50 / €15,-. Age restrictions: All Ages. Box office: 020-5985100. Time: 8:15pm. Admission: 17,50. Age restrictions: All Ages. Box office: 077 – 310 1064. Time: 8:15pm. Admission: € 18,50. Age restrictions: All Ages. Box office: 0413 25 61 10. Time: 8:30pm. Admission: 14. Age restrictions: All Ages. Box office: 0161 45 20 09. Address: Nassaulaan 62-64,. Venue phone: 0161 22 43 14. Time: 8:30pm. Admission: 18,50. Box office: (076) 530 31 32. Address: Claudius Prinsenlaan 8. Venue phone: (076) 530 31 32. Related post.